Strawberries dipped in chocolate mirrored the sweetness of newly formed friendships at a recent farewell dessert reception honoring nine visiting exchange students from the Collège de Gambach in Switzerland. During the event, held in the upper school’s Bistro, both Harker students and their new Swiss buddies breathed a collective sigh of relief that it was not a goodbye party. Rather, the gathering was marked with the anticipation of being reunited at the end of the school year. “I’m so excited that I get to see my buddy again,” explained Zoe Woehrmann, a Harker sophomore who, as part of the reciprocal student exchange program with the school in Switzerland, will have the opportunity to travel there this June. During the farewell party, Woehrmann and her visiting Swiss pal, 17-year-old Fabienne Ghirardin, said they had really hit it off. The excited duo noted they have been having a great time hanging out both at home and Harker, as well as shopping and visiting tourist attractions. 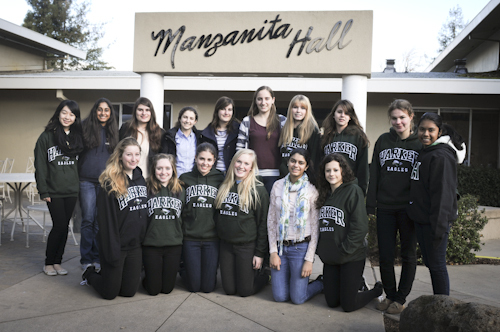 Ghirardin was one of nine girls and two chaperones from the collège whom Harker hosted from Feb. 2-12. The visitors stayed in homestays with Harker families and attended school with their American buddies daily. Come June, a group of Harker students and chaperones will head to Switzerland in continuation of the exchange program. The upcoming adventure will afford the Harker contingent the opportunity to immerse themselves in Swiss culture, brush up on their language skills, and explore the country’s vast natural beauty. The Collège de Gambach is a secondary school under the authority of the department of public education and cultural affairs in Fribourg, Switzerland. The school places a strong emphasis on the formation of character and stresses strong resolve, clear thinking, a sense of responsibility and an appreciation for thorough work habits. In addition to the exchange program with the Swiss students, February saw visits from other international guests to Harker’s upper school as well. From Feb. 6-March 2, two high school-age girls from Tamagawa Gakuen, Harker’s sister school in Japan, attended classes at the Saratoga campus and visited the elementary and middle schools. And, in January, a group of 15 cadets from the Canberra Grammar School in Australia paid a one-day visit to Harker to observe various computer science classes.